Anyway, I made it all the way up, including the final stretch past Rifugio Auronzo, only to enjoy no view to speak off because of the clouds. At least the soup and sandwich in the restaurant were great. While I was enjoying those, I decided I might just as well have a shot at the Giau from Cortina / Pocol – it would save me the trouble of having to get there again. 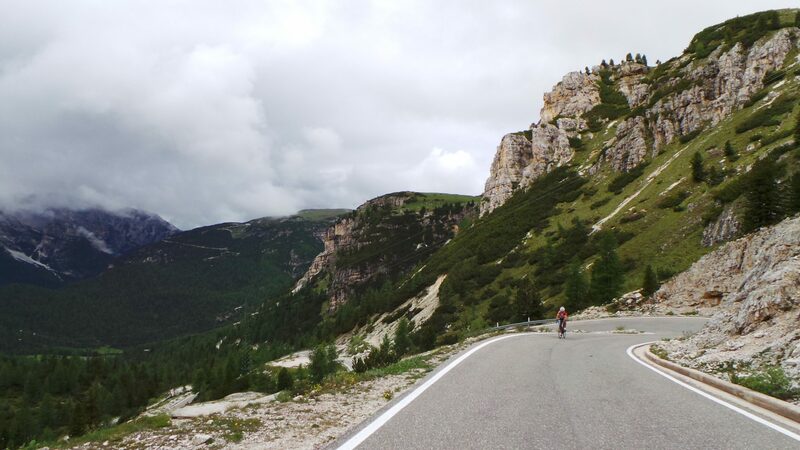 So, I descended from Tre Cime, climbed Tre Croci from the other side – not much of a challenge – and from Cortina, I started the climb of the Giau, which has the first 5 kilometer or so – until Pocol – in common with the Falzarego. And after a warming drink and a bite at the desolate looking summit, I still did not descent the Giau by bike – even I have a limit. Garmin – the Edge got very confused up the Giau. Maybe because of the weather, but it was annoying to see 0% or even negative grades. I do use the number on the head unit, as I can tell on “eyesight” what the incline of the road approximately is. But whether it’s 8.5% or 10% is hard(er) to guess, and that extra 1.5% makes a lot of difference in terms of effort.